CSG’s expertise in specialist tank cleaning is highlighted in the latest (August 2013) edition of the leading water industry journal Water Active. A major feature article – ‘Tank cleaning is essential for environmental safety’ – compiled by CSG Tank Cleaning Manager Darren Negus points out that the tank cleaning, installation and decommissioning process is highly regulated and penalties for non-compliance with the regulations can be severe. Leaking or cracked tanks are potentially lethal to the environment and it’s essential to keep them in good condition. “Keeping your storage tanks clean and well maintained are just part of the responsibility that comes with ownership of these facilities,” says Negus. 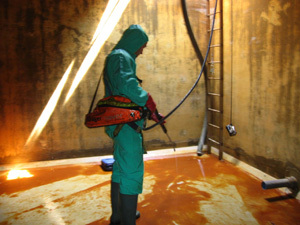 The article lists best practice methods for tank cleaning and includes case studies of major tank cleaning operations carried out by CSG’s specialist operatives. To read the full Water Active article on page 22, Click Here.